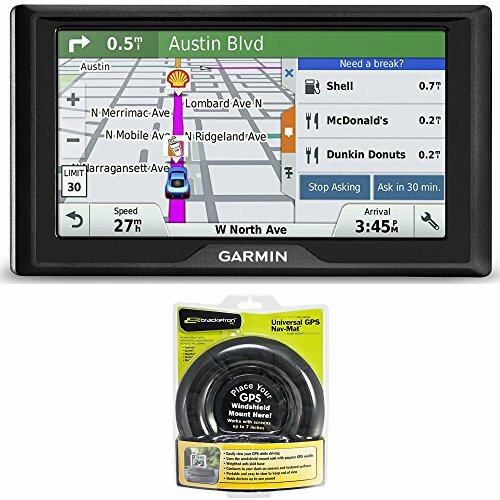 Helpful Driver Alerts for Your Daily Commute Garmin Drive 60 GPS navigator provides driver alerts to encourage safer driving and increase situational awareness. Warnings include alerts for sharp curves, speed changes, railroad crossings and animal crossings. Additionally, Garmin Drive 60 notifies you when driving the wrong way on a one-way street and sends warnings for nearby school zones. Receive alerts for nearby red light and speed cameras. For longer drives, a fatigue warning suggests break times and potential rest areas after hours of driving. The Up Ahead feature lets you easily see places up ahead and milestones along your route, without leaving the map view. Guidance Using Recognizable Landmarks Garmin Drive 60 redefines "spoken turn-by-turn directions" with Garmin Real Directions, easy-to-understand driving directions that guide like a friend, using recognizable landmarks, buildings and traffic lights (e.g., "Turn right after the red building" or "Turn left after the QT"). It's preloaded with millions more new and popular places, thanks to Foursquare. Find Exactly Where You Need to Go The Direct Access feature simplifies navigating to select complex destinations, like airports and shopping malls, by finding a place within a larger location. Direct Access even navigates through parking lots to find the entrance nearest your destination. When navigating to the mall, Direct Access gives additional location information for specific retail stores inside. For example, "Arriving at Woodfield Mall. Anthropologie is inside, on the upper level." Easier to Search, Quicker to Find Garmin Drive 60 has a search field that makes it easy to find addresses and millions of points of interest (POIs). Simply enter a category (like "pizza"), an entire address ("1234 Sycamore Lane, Anytown, USA") or a proper name ("Starbucks"), and Garmin Drive 60 quickly returns your results.